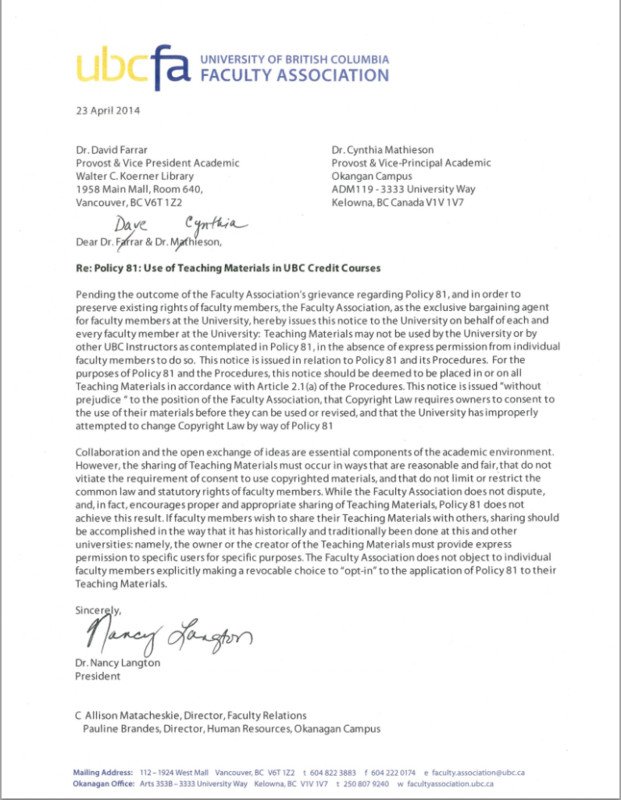 Today the University of British Columbia Faculty Association presented a letter to the University administration declaring a blanket opt-out from the provisions recently enacted in Policy 81 (Use of Teaching Materials in a UBC Credit Course). In enacting Policy 81, UBC granted itself the right to use, share, and revise teaching materials of its faculty. On February 20, 2014, the Board of Governors passed Policy 81 outside its regularly scheduled meeting process. The UBCFA has opposed Policy 81 as drafted, revised, and implemented at all stages of discussion with the University. [A database of teaching materials is] “only good if it’s up to date, it’s searchable and compliance is high,” said Brock. “Most professors are updating their courses every year. The likelihood that we could keep, curate and get people to send to a repository is zero.” (The Ubyssey, “Policy on sharing teaching materials opposed by Faculty Association,” 9 April 2014). Brock’s comments demonstrate that the University is not interested in the current practice of voluntary sharing of teaching materials that has historically and traditionally occurred at the University. Instead, it wants to make sharing compulsory unless you state otherwise. The suggestion within the policy that ownership remains vested with the faculty member who created the materials is totally meaningless and hollow once the University can use your teaching materials at will, including revising them and giving them to others to use. In March, the UBCFA filed a grievance against the University over Policy 81. The Canadian Association of University Teachers has begun the process of censuring UBC in response to Policy 81. CAUT’s procedures relating to censure are available here.